Tomorrow is March 1st, which means it’s about time for me to recap my favorite TED talks of February. 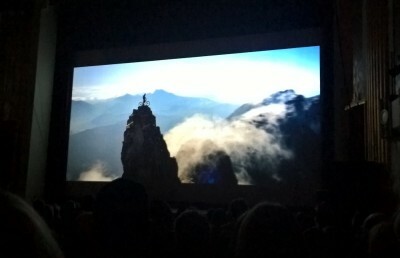 However, today I want to talk about an awesome and inspiring event I attended last night: the Banff Mountain Film Festival. Wondering what the Banff Mountain Film Festival is, and how I got to see it in Denver? Basically, the regular festival (which features all short films and documentaries about mountain culture and adventure sports) takes place in Banff; however, immediately after the regular festival, the best films from the festival go on a world tour of 305 cities in 20 countries. You can find all the locations and dates of the world tour here. I didn’t know ahead of time whether I’d like it, but now I am totally sold – and wish I had gone both nights instead of just Friday night. (They show different films each night.) Definitely check it out to see if it’s coming to your city! While that film is pretty terrifying and obviously insanely advanced (you should have heard the gasps and murmurs in the room at the theater, despite my guess that most of those people are excellent mountain bikers themselves), this made me want to learn to mountain bike… albeit on much easier trails :) In general, that was kind of my takeaway from each of the films: that I want to learn to do the junior, less-death-defying version of whatever they did. So, this summer in Colorado, I’m adding mountain biking and also climbing to my list of things I really want to try. As for today? I’m off to try a new winter activity: snowshoeing out in Golden Gate Canyon. Wish me luck! I bought a mountain bike this fall and have been riding Betasso, Heil and Hall Ranch, and Centennial Cone near Golden. I’m super tempted to go to this women’s bike clinic at Valmonth Park in May to work on my technical skills: http://www.vidamtb.com/valmont/ Interested in joining? ARGH I already have plans that whole weekend (Blend Retreat + Colfax Marathon), but it sounds awesome! If you go, let me know how it is? Bummer! Will do! I think there is one more in June associated with the Betti bike bash (a beginner friendly mtn bike race). Ooh NEAT I would love to do that!